For two Coyote softball players, there remains one year to lift the program from a three-year slump. 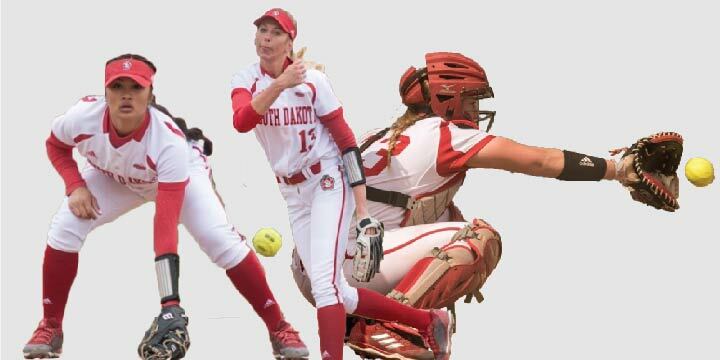 Catcher Jess Rogers and infielder Jamie Holscher are the only two seniors on 2019 Coyote softball roster who have spent all four seasons at USD. They look to lead Coyote softball to their first winning season since 2015. Holscher and Rogers have a special connection. First stepping foot on campus together in 2016, they’ve grown closer each season. Rogers led the Coyotes last season with a .376 batting average, 15 home runs and 45 runs batted in (RBI). Her Summit league-leading 15 home runs were more than her freshman and sophomore season combined, and the second most in school history. Rogers said fixing her swing and pitch selection helped her grow through year three. The other three seniors, Dustie Durham, Alyssa Fernandez and Ashtyn Blakeman all from Arizona, transferred from other schools; Durham and Fernandez played at Phoenix College, while Blakeman played at Scottsdale Community College. Durham and Rogers have also been named “Players to Watch” by Summit League coaches. Durham found success in the circle and the box during her first season with the Coyotes. (Durham’s first season with the Coyotes was successful in the circle and the box.) She finished the year with an 11-13 record and a 4.83 earned run average (ERA) . Durham hit .292 with 21 RBIs and 11 runs scored. Rogers was runner-up for the Summit League Player of the Year and a first-team all-Summit pick last year. The last two years, she was named the league’s first-team catcher. As a team, the Coyotes have eight freshmen and eight sophomores. They also have seven juniors and seniors combined, creating an overwhelmingly young roster. The youth on the team must contribute, but last year’s experience will help them grow. From Feb. 8 to March 27, the Coyotes play 37 games on the road without a weekend off. The time between weekend tournaments is spent traveling to the next tournament, leaving little time inside the classroom for student-athletes. As seniors, Holscher and Rogers know what their roles are in helping the younger players out. Softball, a warm-weather sport, is difficult to play year-round in the upper Midwest. In the winter months, the team practices inside the DakotaDome, where it’s difficult to simulate game action without the dirt and grass. The Coyotes will have to adjust quickly when their season starts this weekend with five games in three days. The first pitch of the Coyote season is scheduled for 12:30 p.m. on Friday, Feb. 8 against Dayton. Later that afternoon, The Coyotes play Charleston Southern. Feb. 9 showcases another matchup with Dayton and Maryland Eastern Shore. Their weekend concludes at noon with a game against Charleston Southern. The first home action for the Coyotes isn’t until March 30, when they play a three-game series with Purdue Fort Wayne in Summit League action.